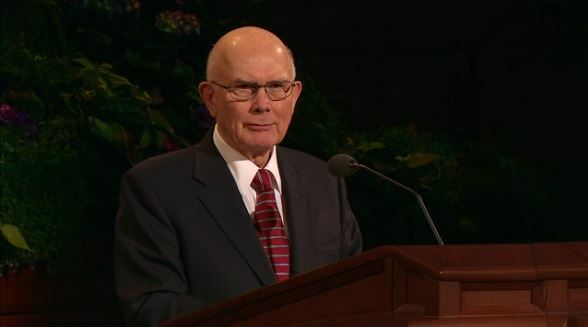 This is an analysis of a general conference talk given by Elder Oaks titled Opposition in All Things, where he warned against taking opposition against the church. I left last weekend’s LDS General Conference inspired and uplifted. Overall, I felt it was very strong in the kind of “practical religion” that I love. Uplifting us, challenging us, giving us guidance in how to live life more abundantly by following the example of Jesus Christ, and reminding us it’s OK when we fail. Very few of the talks were the kind that tweak the critics of the church. Except of course Elder Oaks’ talk, which has been making the rounds in social media. The purpose of mortal life for the children of God is to provide the experiences needed “to progress toward perfection and ultimately realize their divine destiny as heirs of eternal life.” As President Thomas S. Monson taught us so powerfully this morning, we progress by making choices, by which we are tested to show that we will keep God’s commandments (see Abraham 3:25). To be tested, we must have the agency to choose between alternatives. To provide alternatives on which to exercise our agency, we must have opposition. As a result, Lehi continued, “the Lord God gave unto man that he should act for himself. Wherefore, man could not act for himself save it should be that he was enticed by the one or the other” (verse 16). Pretty basic stuff. Where some people took exception was where he started to define what some of this opposition is. Some of this opposition even comes from Church members. Some who use personal reasoning or wisdom to resist prophetic direction give themselves a label borrowed from elected bodies—“the loyal opposition.” However appropriate for a democracy, there is no warrant for this concept in the government of God’s kingdom, where questions are honored but opposition is not (see Matthew 26:24). This statement really touched a nerve, and I understand why. But I think there may be a misunderstanding of how Elder Oaks meant the word “opposition”. Some are taking it as saying members are not allowed to disagree with the brethren. Some are interpreting that as saying members are not allowed to express disagreement or any kind of faithful dissent. To say that anybody who disagrees with a general authority of the church is betraying Christ and that it would have been better had that person not been born, that to me is a large overreach. What did Elder Oaks mean when he used the word opposition in this context? I’m going to make a case that the word has a specific meaning that if people had understood, they’d be OK with the talk. In parliamentary systems of government, the term loyal opposition is a term applied collectively to the opposition parties in the legislature to indicate that the non-governing parties may oppose the actions of the sitting cabinet while remaining loyal to the source of the government’s power. The idea of inquisitorial opposition that held the executive to account emerged in Great Britain. Elder Oaks was an attorney, and has background in studying and using standard legal and political definitions. It appears he was speaking to this very narrow definition of loyal opposition with roots in British Parliament. It is when the party that is not in power is doing everything they can do within the law to remove the ruling party from power. Campaigning against, trying to impeach, swaying public opinion against, etc. Elder Oaks says this is OK in politics but not OK in the church. 2. The scripture Matthew 26:24 is referencing the betrayal of Jesus by Judas Iscariot. That night, his apostles had questions and doubts. He wasn’t referring to that. He was referring to the betrayal by Judas. I do not refer to the kind of criticism the dictionary defines as “the act of passing judgment as to the merits of anything.” (Random House Dictionary,unabridged ed., s.v. “criticism.”) That kind of criticism is inherent in the exercise of agency and freedom. In the political world, critical evaluation inevitably accompanies any knowledgeable exercise of the cherished freedoms of speech and of the press. In the private world, we have a right to expect critical evaluation of anything that is put into the marketplace or the public domain. Sports writers, reviewers of books and music, scholars, investment analysts, and those who test products and services must be free to exercise their critical faculties and to inform the public accordingly. This kind of criticism is usually directed toward issues, and it is usually constructive. My cautions against criticism refer to another of its meanings, which the dictionary defines as “the act of passing severe judgment; censure; faultfinding.” (Ibid., s.v. “criticism.”) Faultfinding is “the act of pointing out faults, especially faults of a petty nature.” (Ibid., s.v. “faultfinding.”) It is related to “backbiting,” which means “to attack the character or reputation of [a person who is not present].” (Ibid., s.v. “backbite.”) This kind of criticism is generally directed toward persons, and it is generally destructive. 5. Elder D. Todd Christofferson, in interview with Daniel Woodruff March 13,2015. This is the one I think is most pertinent. It’s recent. It was given by an apostle in a formal setting. It was specifically addressing this issue and defining the boundaries of what’s OK and not OK.
6. Richard Bushman in a podcast interview, on how to express dissent, discussing the idea of loyal opposition, and using the same comparison Elder Oaks did with the model of democratic political process in contrast with God’s kingdom. I don’t think you can ever abandon your conscience. Ultimately you have to be responsible for your own lives, you have to decide for yourself what is right. President Uchtdorf has told us the brethren make mistakes, so we can’t expect perfect, unmitigated, exact truths of every kind come from the brethren. It’s coming from their minds, we have to decide how it applies to us, there’s no escaping that responsibility. But what I’m pleading for is respect for those opinions. Recognize that they come from very strong, good, very experienced men. And take what they say very, very seriously. In the end you may come down slightly different, but if your spirit is right and you really are trying to do what’s right, you’ll be ok. They’re not going to condemn you for disagreeing with something like that if you do it in the right spirit. If we take as our model American politics, where you advocate, you fight for things, you try to remove people from office, and try to protest and arouse public opinion. Democracy is not our model. Our model is brotherhood and sisterhood, where we try to work together we try to reach understanding, we have to maintain that spirit of brotherly and sisterly cooperation and within that spirit you can say all sorts of things and be just fine. So, there are six data points that all point in the same direction. The brethren don’t always very clearly and specifically define what is OK and not OK. The Doctrine and Covenants says it’s not good to be commanded in all things, and we usually take this to mean God (and the brethren) are allowing some latitude in how we interpret commandments and doctrines. The brethren are used to using open ended language to help maintain that big tent of interpretations we have in the church. So, I don’t think it’s fair to condemn Elder Oaks for not fleshing out all the details of what he meant, even though in this case a more liberal interpretation would serve to make that tent smaller. I think the brethren are making a distinction between innocent disagreement and questions and more sinister (though “loyal”) opposition. They are not calling the former opposition. But they are drawing a line in the sand and asking/commanding members not to oppose the church by taking an organized, aggressive effort to stop or slow the functioning of the church. If you have simple disagreement on some matters with the brethren, you don’t need to worry about what Elder Oaks said. He wasn’t referring to you. Jeremy Runnels, author of the CES Letter, apparently has recently been scheduled for a disciplinary council with possible excommunication. I would prefer there be no excommunication at all in the church (I’m disagreeing here not actively campaigning against it or demanding change), but the church has established the standard of excommunication for severe cases of opposition. He and his supporters are claiming he is innocently asking questions, but it appears to me he is doing much more than that. Jeremy’s actions appear to be be more on the side of what Elder Christofferson’s definition of opposition: an “organized…effort to attack our functioning as a church”. Finally, I want to address another quote from this talk, taking this in a different direction. Elder Oaks is acknowledging that there are troubling aspects of church history, that despite the church making greater efforts in transparency, simply can’t be resolved with more study. He is shifting the definition of truth away from the accuracy of all foundational church events to the truth and beauty and fruit of the LDS church today. Learning by faith = testing living the Christ centered LDS life and determine if the fruit of that is to experience life more abundantly and richly. Elder Oaks has obviously been reading the churchistrue blog (for the sarcasm impaired, I’m kidding). They decide to stay or leave based on how they view the truth and beauty of Mormonism and the fruits of the church in its current state not in the accuracy of its historical origins. My sacramental approach to Mormonism finds truth in the LDS church not in its historical origins but in the truth and beauty and fruits of the LDS church today. It helps me live a Christ-centered life, worship God, and provides a community for me to serve and be served. My life is enriched. We have tested the fruit of the church and it is good to us. We find joy and beauty and truth in living a life of faith by LDS principles. In the metaphorical/sacramental paradigm, the value of a religion doesn’t come in its historical claims or literal claims to authority from God. The value of a religion is in the good fruit experienced in the lives of individuals, families, and communities. Truth of a religion is in the ability for its members to worship God and find a meaningful relationship with him. It’s in the ability to improve and better ourselves. It’s in finding and living the abundant life. I have been hoping the brethren would make room for people with my views by slowly shifting the definition of truth from historical claims to the fruits of the church today. Maybe that quote is evidence it is happening.